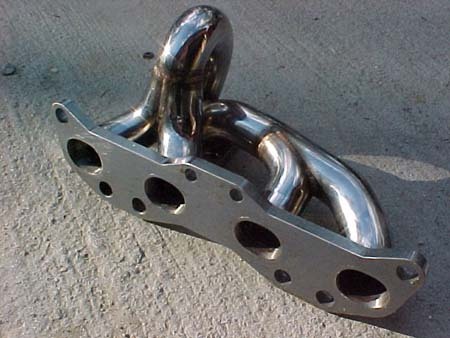 has anyone here made and got a pic of a tubular manifold that they have made for the t2 t25 flanged turbo? Anyways here is a pic i have some pics of it off the car at home. It looks crappy and brown there but now it\'s been used it\'s silver again. You will be making it from steam bends i presume? I dunno if you have made one before but you have to be very carefull with the alignment as you weld, my mate made one for his 3TGTE powered celica and the collector ended up horribly out of alignment. It was his first go though, he\'s much better now, he\'d prolly make it out of stainless next time though since that\'s what his job is mostly now. Making a steam bend manifold you might start running out of room next to the motor, my stainless mani is quite cramped as it is and it\'s walls are only about 2mm thick not 5mm. Another way might be to do as this manifold has been done and merge the primarys early. They shouldn\'t interfere with each other to much cos 1 and 2 don\'t exhaust pulse at the same time anways but i havn\'t seen that manifold on the dyno. One\'s with separate primarys like mine up there are good for between 7-12kw@rw from what i\'ve seen on dynos down here. also did you have to notch your transmission so the elbow would clear?